Junk food is bad for health. Its definition tells its inner story—food that is high on calories and saturated fat but low on nutrition. Junk food is all about pleasure and empty calories. So, the world is worried. It is now linked to the growing epidemic of non-communicable diseases—the ‘fat’ problem. Every ailment from heart diseases to hypertension and diabetes is linked to how one eats and how one exercises. Junk food has become the world’s biggest health headache. And some governments are taking action—banning junk food advertising in children’s programmes, removing it from schools and even imposing a fat tax. Sugar, salt and fat are items that need to be regulated. This means governments have to step in to control the powerful processed food industry. But this is not happening in India. It believes food industry has full privilege to sell anything—and kill people slowly and sweetly. So, the Pollution Monitoring Laboratory of the Centre for Science and Environment, a non-profit in Delhi, decided to investigate the food people love to eat—everything from chips to bhujia and instant noodles to burgers. All the food that is sold to us through persuasive and glamorous advertisements; all the food that our film and cricket stars tell us to eat. The laboratory checked for fats, carbs, salt and trans fats. The results are deadly and damning. Eat at your own risk, is the message. There is no proper definition for junk food. According to the Food Safety and Standards Act of 2006, foods like burgers, pizzas and chips fall under the category of “propriety or novel” food, for which standards have not been specified but they are not unsafe. So this category of foods declare their composition only broadly. Fast food giants take advantage of this provision to dupe consumers. 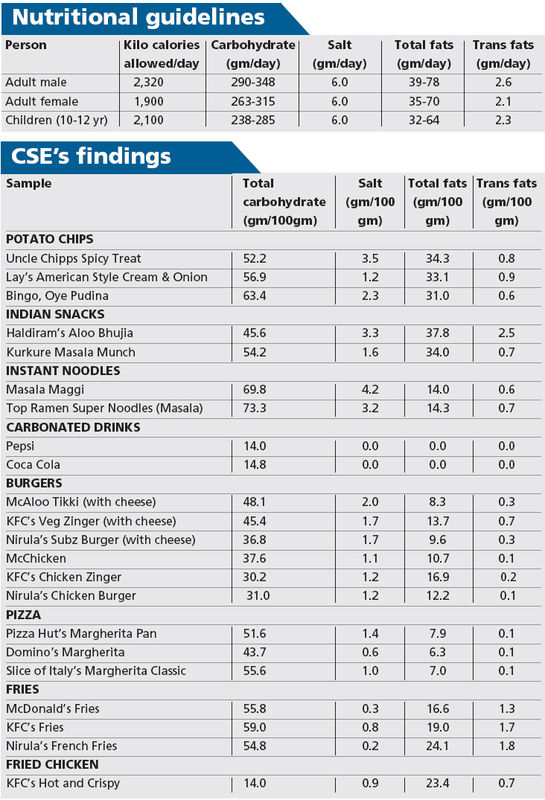 Even though Food Safety and Standards Authority of India (FSSAI) mandates food companies to declare the information of the total energy, carbohydrates and sugars, proteins, fats and transfats on the product label, the study by the Centre for Science and Environment (CSE) reveals that the consumer has no way of knowing what he or she is eating. Flouting norms: Haldiram Aloo Bhujia and Top Ramen instant noodles claim to be trans fats-free. But CSE study found they are not. As per FSSAI rules, a product can claim to be trans fats free if it contains less than 0.2 gm of trans fats per serving. As per the CSE study, a packet of Top Ramen instant noodles has 0.6 gm of trans fats; 100 gm of Haldiram Aloo Bhujia has 2.5 gm of trans fats. Though Haldiram claims its serving size is 10 gm, it is nothing but a gimmick. Consumption habit of people exceed this serving size and they end up consuming more trans fats. Misleading claims: Many brands put misleading information about their trans fats content on the label. Products like Lay’s American Style Cream & Onion claim that they have “zero” trans fats in 100 grams of their products. However, CSE study found 0.9 gm trans fats in 100 gm of the product. Similarly brands like Haldiram Aloo Bhujia, Bingo Oye Pudina chips, Top Ramen noodles claim they have “zero trans fats” per 100 gm of product. But CSE results show otherwise. No standardisation: Lay’s American Style Cream & Onion chips carries the nutritional information for both the serving size of 14 gm and 100 gm on its label. But Uncle Chipps Spicy Treat does not mention the nutritional information for a serving size. It just provides the nutritional data for 100 gm. Lack of nutritional information for a serving size leaves one with no scope for knowing how much calories he or she consumes. Nutrition jugglery in claims: Till February this year, Frito Lay’s products claimed to be “smart snacks” because they used a healthy oil. At that time, the labels clearly mentioned that the products were trans fats-free. But from March onwards, the product ceased to be “trans fats free”. But this shift was never mentioned in advertising blitzs. When CSE tested Lay's American Style Cream & Onion chips, it found that 100 gm of the chips contained 0.9 gm of trans fats. With the shift to palm oil, it is difficult to know the level of trans fats in the chips currently available in the country. 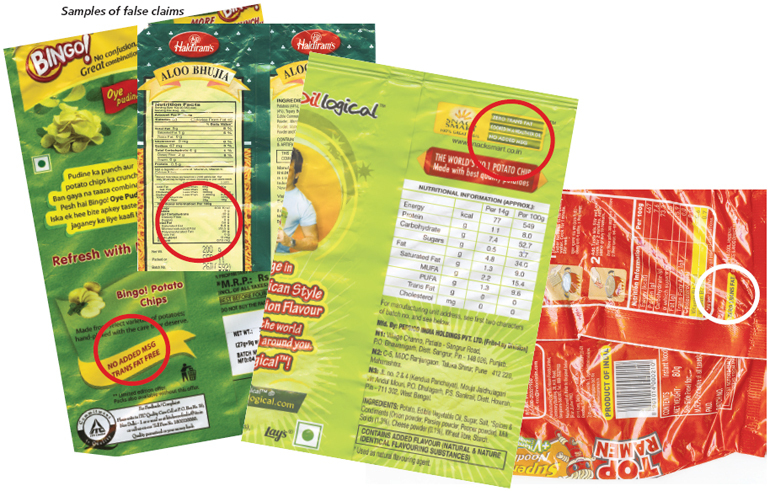 No claims: The non-packaged junk foods in India give nutrition information on their websites, but there seems to be a double standard in the play. 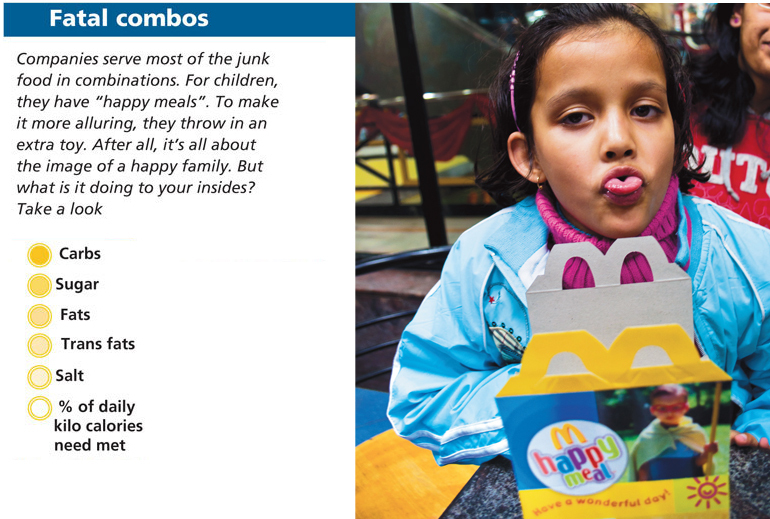 McDonalds, for instance, gives information on 22 nutritional attributes on its US website. This includes information on different types of fats and even information on the levels of trans fats in the product. 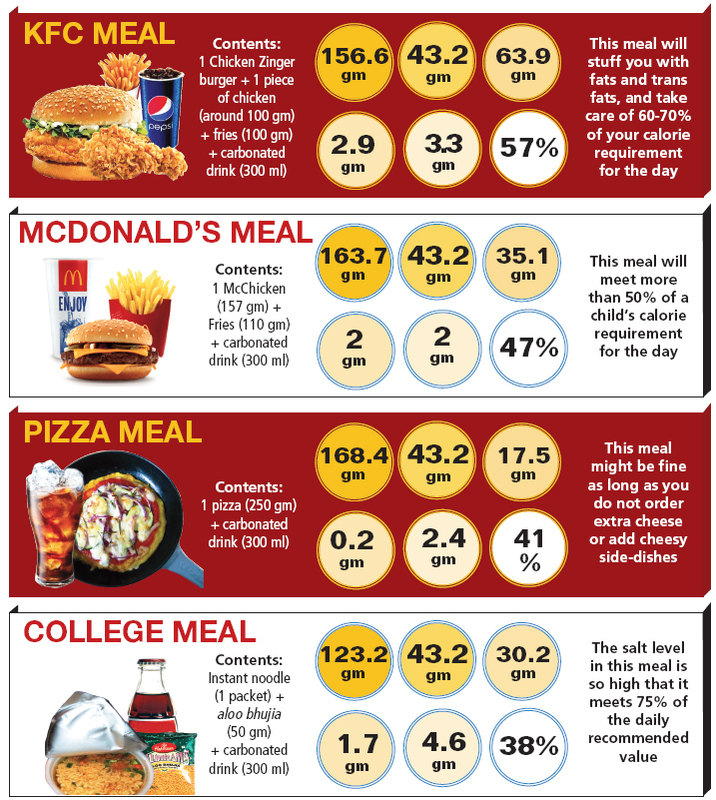 On the other hand, McDonald’s website for India provides information only on six nutritional attributes. Most importantly, it fails to provide any information on trans fats. But the company at least provides information on portion sizes in India. Other companies do not even do that. Pizza Hut’s website for India is a case in point. The company’s website in the US provides 12 nutritional attributes of the product, including the serving size, and even trans fats. Its website for India provides only six attributes in the dining menu; it does not mention trans fats. Its delivery menu does not provide any nutritional information. KFC’s website in US also provides the information on 12 nutritional attributes including the serving size, types of fats, including transfats, and fibres. But its Indian website gives only four nutritional information. There are no bad foods, only bad diets. So say many nutritionists. What make junk foods so unhealthy are the high-levels of fats, salt, sugar and carbohydrates in them. This nutrition profile adds to obesity and our increasing non-communicable diseases (NCD) burden. The Public Health Foundation of India (PHFI), a non-profit in Delhi, finds that NCDs were responsible for more than half of all deaths in 2005 and by 2030 will be the reason behind two-thirds of all Indian deaths. The latest National Family Health Survey, conducted in 2005-06, shows at least one in every eight people is overweight or obese. In urban India at least one in every five people is obese. Obesity in women has increased by more than four per cent between 1998 and 2005. It is a salt, sugar and fat problem. Salt: Current global salt consumption in diets is 9-12 grams per person per day. WHO wants this halved, which will bring down coronary heart disease and stroke by 18-25 per cent respectively. In India, consumption of salt ranges between five and 30 gm. But the challenge of hypertension is growing. Bad food is adding to this. Just consider: one packet of chips has 2 grams of salt: one-third of your daily quota. Bad fats: It is agreed that 15 to 30 per cent of our daily calories should be from fats, with not more than 10 per cent from saturated fats; trans fats should contribute at one or 2 per cent. India is already known as the diabetes capital of the world; it is home to one-fifth of the world’s type-2 diabetes load. So fat is bad. But a KFC chicken combo-meal, sold so lovingly to people, exceeds their daily fat and trans fats quota. But they are not told. Carbs and sugar: Bad, we know. But do we know that while the National Institute of Nutrition (NIN) recommends 20 grams of added sugar in Indian diets, one 300 ml bottle of Pepsi or Coca-Cola has 42 gm of added sugar. You have just blown up your daily sugar quota two times over. Governments are waking up to this fat-salt-sugar-problem. Several countries, including Ireland, Mexico, United Arab Emirates, and several US and Canadian states, have banned sale of junk foods in and around schools. In 2008 the UK banned junk food advertisements during television programmes aimed at children under 16 years. In March this year, Scotland proposed to ban junk food ads in TV shows aired before 9 pm. Denmark and Hungary imposed a fat tax on junk food last year. The surcharge is levied on food items like butter, milk, cheese, pizza, meat, bacon, ice-cream and processed food if they contain more than 2.3 per cent saturated fat. In Canada, a food product can be labelled as “free of energy” if it provides less than 5 kilo calories per serving of stated size. Still, all is not well in this fat world. One, junk food industry targets children as present and future consumers. It is, therefore, important to ban junk foods from schools and places where children can have easy access to these foods. 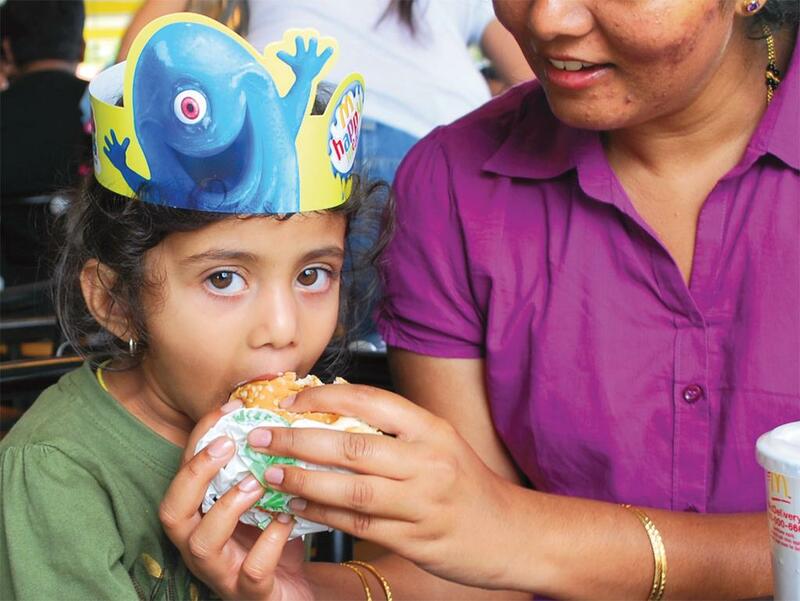 Two, to prevent children from junk foods, the Advertising Standards Council of India has guidelines in place. For example, it says, “Caution and care should be observed in advertising of food and beverages especially ones containing relatively high levels of sugar, salt and fat” during television shows directed at children. Yet, there is hardly any restraint on advertisements. FSSAI should mandate advertising guidelines for these foods, including the time for airing of these advertisements (after 9 pm). Three, FSSAI should come out with regulations to reduce salt, sugar and fats in junk foods. It should also follow the examples of Hungary and Denmark and impose “fat tax” on high-fat processed foods, making them expensive. This would dissuade consumers from such food. Four, knowing the truth will help. The government should introduce mandatory labelling, at least for serving size, trans fats, saturated fats, sugar and salt, along with already mandatory nutritional information for all processed foods. This would help people make an informed choice. This should also be applicable to takeaway foods like pizzas and burgers. They should be asked to provide easy access to information on the wrappers/ boxes. Then, may be, all will be well. Very important article on dangers of fast food being doled out by popular brands. Imported GMO's would surely have found their way into our food system. Need to bring pressure on our Govt into making labeling of GMO's mandatory. It was a good piece of information. In addition to the mandatory labeling given in the fourth point, there also should be information what National Institute of Nutrition prescribes for a day. For example in this article, it writes that NIN prescribes 20 g of sugar is ideal for a day. This information for fat, trans fat and salt should be provided on the wrappers thus helping an average person to identify the facts right when purchasing. Wish Subway was also included in the survey. its increasingly being marketed as healthy, and the website lacks any nutritional info breakdown for what is served in India. It has been known for a long time that they are a disaster for the body by reducing the body to the status of junk.Modern day sedentary lifestyle coupled with high fat,sugar and salt food is a perfect recipe for the body playing host to number of diseases.Western foods like these have made us turn away from traditional snacks which are nutritious and tasty.Govt should seriously consider regulating them in the best interest of the society as these are depleting the vitality and reducing the productivity of the people.With the advancement made in the medicine one can claim to overcome the diseases and live longer but it's not about longevity it's the quality that matters. They won't dare to do that in the US because they know they would be sued for millions of dollars. In the rest of the world where these multinationals do business, they know that there are ways to take advantage of loopholes plus they know that most Indian consumers are not as aware of nutritional values before they consume any packed food. So we need both awareness and stricter laws or at least someone to sue one of these companies big time be it Indian or multinational. Thanks for bringing this out in the open and blowing the lid. This will at least wake up the slumbering authorities who are paid to protect consumer interests. Really,its a Very important article on dangers of fast food,especially for the CHILDREN. 2.I've also watched Ms Sunita's interview on Star TV. 3.I support you and also suggest to prepare a one page Research Information and put it on You Tube or on Blogs and on social network webs like facebook etc. If a simple song like "kolavery-D" goes HIT via internet then YOUR RESEARCH HAS ALL MERITS TO REACH EVERY INDIAN. 'Junk food villains' truely becomes a kitchroom tool and mother's recipe. THANKS A LOT TO EVERY PERSONS OF C.S.E. FOR PUBLISH ABOUT JUNK AND FAST FOOD ,DRINKS . 1. SPECIAL THANKS FOR MRS SUNITA. 3.LET IT PUBLISH THROUGH FACE BOOK SITE . 4.LET THE CHILDREN SHOULD EDUCATE THROUGH SCHOOL. RAMDEV" DAILY TO THE CHILDREN OF EARLY AGE . TO HEALTH .GET THE DETAIL ANALYSIS ABOUT. THANKS A LOT TO EVERY PERSONS OF C.S.E. FOR PUBLISH ABOUT JUNK AND FAST FOOD ,DRINKS . 1. SPECIAL THANKS FOR MRS SUNITA. 2.A REQUEST TO UPLOAD THE VIDEO INTO YOU TUBE 3.LET IT PUBLISH THROUGH FACE BOOK SITE . 4.LET THE CHILDREN SHOULD EDUCATE THROUGH SCHOOL. 5.PL. REFER THE SAME REQUESTED BY YOGA GURU "SWAMY RAMDEV" DAILY TO THE CHILDREN OF EARLY AGE . 6.REFER ALSO "RAJIV DIXIT" ON YOU TUBE TO AVOID FAST FOOD AND COLD DRINKS WHICH IS HIGHLY HARM FULL TO HEALTH .GET THE DETAIL ANALYSIS ABOUT. I always wondered how Lays chips could be transfat free and now, I know the answer... they never were. I would also like to add another item to your list - ban the free toy offers with all kinds of food targeted at children. They don't know any better and most times, neither do their parents. The free toy is really like free poison. I think even if the government bans some things, there will be loop holes for these industries to take advantage of. The answer lies with parents; they need to guide their children and not give in every time they ask for junk food. Hello, I agree with the demand for proper labeling, but rest of things are not at all good. If branded products have so much fats and carbohydrates, then what is the food served in hotels, darshinis, rood side food vendors how much of fats, transfats is there in them goods knows definitely it is much more than the listed food here. Even you make bujji in your house then calculate all the above parameters, there is no doubt even your house bajji is also contains all the said components then what make the difference. How can the Indian allowance for salt be 6 grams per day? In the US, it is only 1.5 grams a day and people are much heavier on average. "Americans currently consume an average of 3,400 milligrams of salt daily. Excessive intake has been implicated in heart disease, strokes and other maladies costing billions of dollars annually. The new guidelines lower the recommended maximum daily intake of salt from 2,300 milligrams to 1,500 milligrams." For Indians, since they weigh less than Americans, the limit should be around 1.3 grams a day not 6 grams a day. The study is an eye opener that even labels cannot be trusted in India. But at the same time it does not differentiate between natural transfat like CLA (conjugated linoleic acid) and the artifitial ones. CLA is shown to protect against cancer and are found in over 2% in milk and meat. great! we need this debate to stop the obesity epidemic that's hit the western countries. Indians are prone to lifestyle disease due to poor genetic makeup, also we are getting more sedentary. we also have to deal with higher stress, in most of urban India. I must thank the CSE for bringing up this debate. we are bombarded with visuals, mostly to the vulnerable target - kids. the corporates like nestle & others are totally disgusting in their lack of morals. they show misleading ads - vitamins in foods to boost their hollow claims. gee!? you let an american company come over and sell you food?!? what did you expect really? I live in america and I don't eat mcd/kfc/bkg, I also don't think the indian govt has to tell you that mcd is bad for you. common sense really. indians also have to get over kfc garbage, every kfc I saw in india was jam packed with people. kfc's in america are empty and going out of business. western culture is idiotic, stop idolizing them and don't eat what they eat. This finding is really an eye opener. I appreciate the good work that CSE has done by bringing out the junk food issue to the public domain. But the way the whole debate is going on, i believe we are missing the forest for the trees. Trans fats are produced during the process of hydrogenation of oil and ,therefore, found in all types of hydrogenated oils. And hydrogenated oils used in cooking all food dishes we eat outside our homes - be it Mac or our street vendor sold samosa and the unlabeled chips found in supermarket shelves. True KFC and Mac should serve as per their stated labels. But what percentage of Indians go to KFC or Mac? Very minuscule. So let's focus on the big issue of use of hydrogenated oil in cooking and do something about it. It is pretty grim picture. It is pretty grim picture. WTO has enabled the multinationals invade our country and make people sick-very-sick. Our country do not have regulations of food safety and whatever little there is, it is not implemented at all. The authorities wait for a calamity to happen to act. There is no will to implement and the corrupt regime lets the MNCs to have their way freely as long as the money serves them. The value of human life is like pests, and rightly so, there are treated as such. CSE has done a good job by highlighting the issue in a scientific manner. This is a beginning and is the alarm bell for the people and the rulers of the country. JUNK FOOD IS A SILENT & SLOW KILLER. Really, it is a very informative research. My special thanks to Ms. Sunita & her team for the wonderful study. A GOOD ARTICLE .IT IS NECESSARY TO SPREAD THE AIR OF AWAKENESS AMONG THE PARENTS.THIS TYPE OF MATTER SHOULD BE PRESENTED ON T.V. BECAUSE CHILDREN AND EVEN ELDERS EAT WHAT T,V. SAYS OR PUT IN THEIR MINDS. A good article. It gives a lot of valuable information. WE all are eating a lot of junks every day without knowing much about the danger of it. So I thank C S E team for an article like this. I am a good food lover and cannot stop avoiding all the above mentioned food items. You cannot find good and happy life without those items. Could anybody have data like It will be good to have above food at defined timeframes(like weekly once or monthly once) so that could make many to go with precautionary. bottom line : once in a while is 100% good and healthy to have Junk foods. It provides even Health resistance to you automatically. else for simple things people might feel unhealthy..
Another eye opener from CSE. Another eye opener from CSE. But this is common sense & we have known this all along. simple home food is best. Can CSE come up with food recipes of old times that uses raagi & millets that used to be staple diet. Also white polished rice is one of the culprit that has dislodged other healthy cereals. Our country is misled with the "fats are bad" fallacy which swept the US in the 80s and has made them cut fats and eat calories instead resulting in a blown up obesity epidemic. Sweden has recognised the fallacy and are using more fats than refined carbs as their source of energy (they term it the "Low Cal High Fat" diet) and has begun to see a reverse in obesity levels. Thanks for CSE specially Ms Sunita Narayan for wonderful , educative and socially responsible act of making people aware of the foods we are consuming. Hope those at Policy /Planning and Regulatory levels will at least wake up now and stop continuance of all such businesses which are playing havoc with the lives of millions of Indians including Kids. However before making food labeling mandatory one has to have proper scientific data of the nutrients. Nutritional valve varies based on so many factors.Each brand might claim they use different ingredients. So first these values must be scientfically approved. This is truly a great addition. I have read this dangers of fast food. I really like your way of writing. First off, I came across your site and wanted to say thanks for providing a great health resource to the community. Naturally, I’d be delighted if you share this embeddable graphic on http://www.downtoearth.org.in/coverage/eat-at-your-own-risk-37902 , or share on social. Either way, keep up the great work !